I wanted to share a quilt with you all that I have a privilege of being a part of making recently. My dear friend Kaelin aka The Plaid Scotty, just had her first baby! 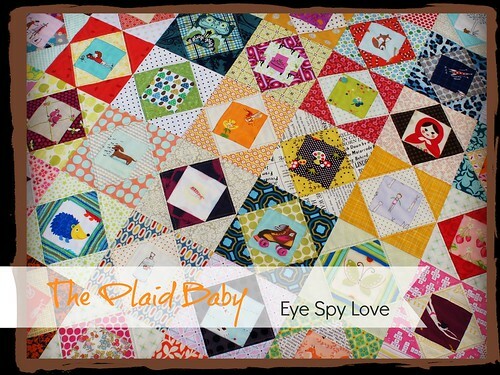 And a group of quilty friends got together to make her a rocking eye spy quilt. We threw her a virtual shower and managed to get it in just under the wire, because that little gal decided to make an early appearance! 3 weeks early! Baby and mama are all doing great (though understandably all rather tired from the very recent events and subsequent lack of sleep that comes with newborns). It’s been so hectic that I haven’t even had a chance to talk to the new mama! But I know that sleep is precious and I don’t want to take any time that could be spent resting. There were about 10 us making this quilt for Kaelin and her “plaid baby” as she is known to us; Cherie, Cara, Michelle, Kelly, Kristie, Ali, Amy, Rene, Elena, Tracey and myself. They know who they are and I’m too lazy to link to all of them 😉 But we all love Kaelin and her newest family member, and we wanted to make her an awesome quilt…the kind that you know a fellow fabric lover will appreciate. It took us a lot of back and forth before we finally decided on this simple but oh so effective pattern of square in squares. 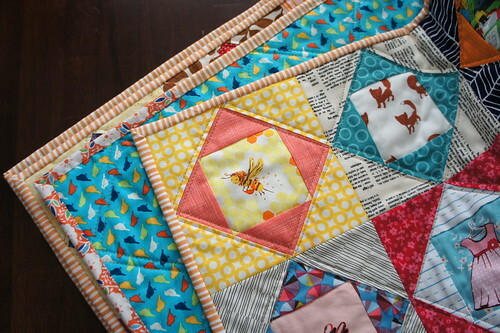 It really gives you a chance to show off fabrics and do some fun fussy cutting. One of us had the fairly genius idea of paper piecing all of these blocks. No, they don’t have to made that way. But since we had so many people making blocks, this was a perfect way to make sure that all of our blocks were the same size. When I went to sew all the blocks together, it was easy peasy. Soooo grateful we did it that way and I would definitely recommend that if you are doing a group quilt. Kaelin and her husband had a darling theme in mind for their nursery, The Fantastic Mr Fox. 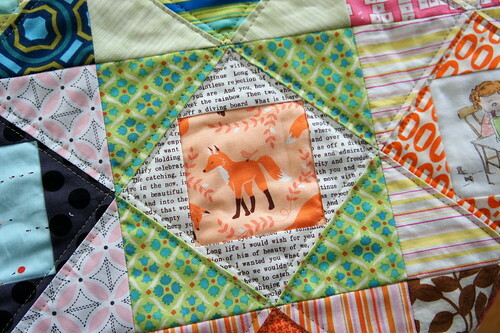 So we were all eager to include as many little fox fabrics as we could. Thankfully that’s a fairly decent trend right now, so there were some pretty cute fabrics out there just waiting to be fussy cut! 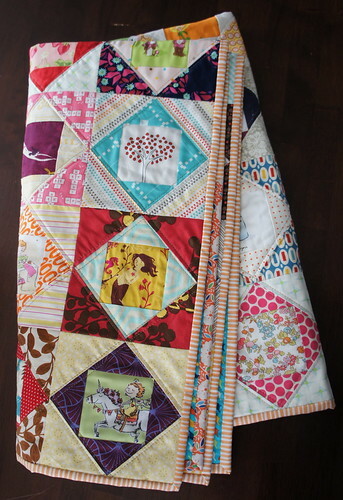 But everyone dove into their special precious fabrics for this quilt, using bits of Heather Ross prints, AMH, Sarah Jane, Aneela Hoey, and just about any possible cute fabric you can think of! It is full of gems and I couldn’t stop taking pictures of it. Each block is a little treasure box. We made Kaelin try to guess who made each block and while we certainly didn’t get through all of them (there were 56 blocks!) she did guess each one she picked out correctly. And I love that we know each other well enough to know what block we would each make. Our personalities all just come through. Though you may not notice at first glance, this quilt is put together from blocks using a low volume alternating pattern. It helps keep the quilt balanced and the colors evenly distributed. Almost no one person’s block is next to another block that they made. And that also helps keep the quilt balanced (otherwise we might have had a whole bunch of Heather Ross blocks on one side! lol). With a quilt design chosen to set off the fabric selections, I wanted to choose a similar quilting pattern. So I kept it simple and neat with double straight lines running on either side of all four sides of each block. I love how it turned out. Sometimes straight lines really are the best option. Most of the binding was done with this perfect Dear Stella stripe (I think! my brain is failing…. ). This was the last of that fabric in my stash and I’ll admit that I’m sad to see this one go. It’s such a great light orange (not peach) stripe that plays well with others. And perfect for a fox themed nursery. 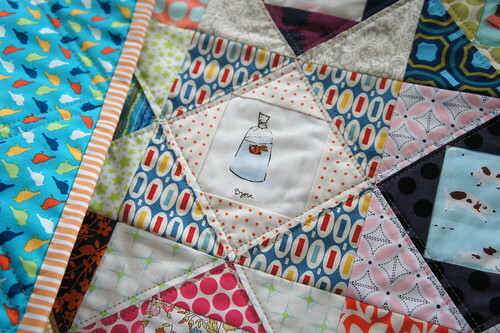 Add in a fabulous backing and a darling, fun quilt label and you have one beautiful eye spy quilt. Perfect for the Plaid Baby who must have been waiting for it to arrive because she came just a few days later. 😉 Some babies just know when their quilts are ready. And boy are we ready for you little gal!! It looks so fabulous!!!! So glad to be a part of welcoming Merida to the world. 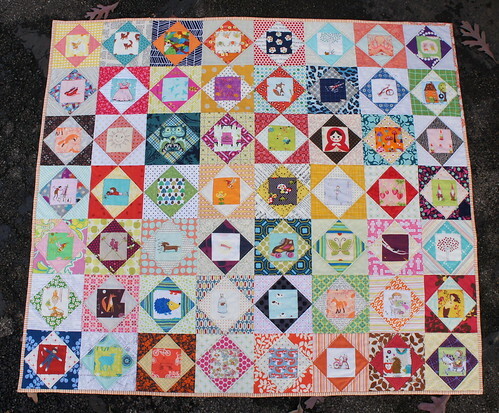 And Ang you did a great job piecing and quilting this beauty! Thank you so much! It took the love and work of many hands! Can you please share the patter? Not the paper pieced version. Spectacular! Such a lovely quilt! One of the most unique "I Spy" quilts I've seen! Wow, what a wonderful baby gift to make and to receive! This is so special and so sweet. 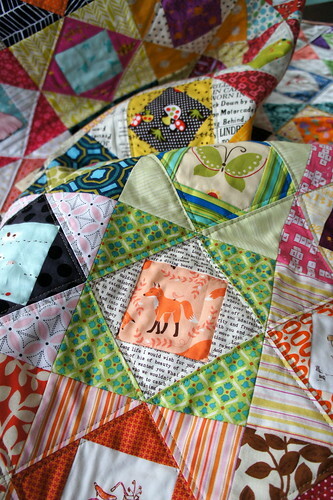 I love the idea of the paper piecing. This is such a great quilt! What a fantastic gift! What a great quilt! Love everything about it 🙂 lucky little gal! What a lucky little baby! This is spectacular. Thanks for the tips for making it as a group. What size are the inner and out blocks? It's so lovely, Angela! I was admiring it in our UFO photostream. So, you alternate value how? Medium, low, medium? Medium, low, dark? It creates an absolutely beautiful effect and, of course, I want to make one, too! Eye candy indeed! Just fab. Yes it is! I could practically eat it! I might be able to do that. I just need to figure that out again…something about adding a google file with a pdf in it I believe. But it's simple to draft. A finished 6" block with two inset squares. Yes, thank you! Now that I know the size – it should be no problem. Your beautiful work is very much appreciated. 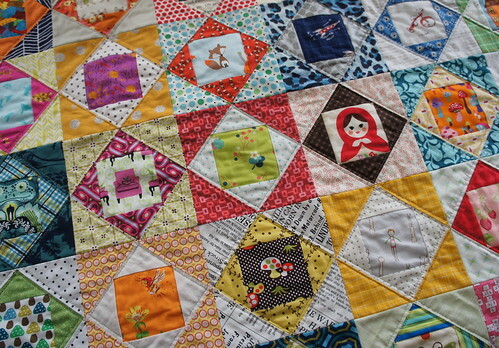 Fabulous quilt, love all the wee I Spy centre, so cute! 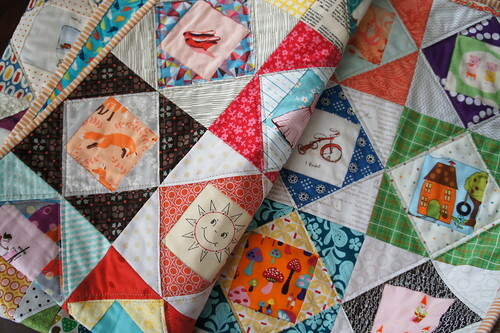 LOVE this quilt idea, especially as a group project. What a very blessed little baby to have received a quilt made by so many and so much love. She is indeed blessed and loved! We have been working on this for ages now and looking forward to her arrival even more! Adorable quilt! Y'all are such sweet friends! 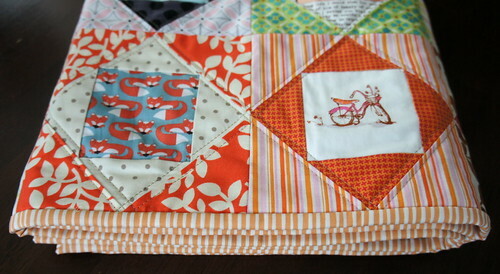 The block shows off those special prints perfectly and the colors are so rich. This is fabulous! What size were the finished blocks? 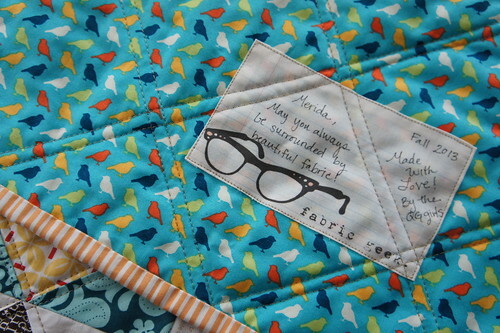 Love that quilt and the story behind it. I love looking at the pictures and discovering cute new fabric and nice fabric combinations. Well done. What an incredible quilt! This is going to be a family treasure, I have no doubt!